The presidential office says that the presence of U.S. troops in South Korea will be needed even after the armistice that ended the Korean War is replaced by a peace treaty. A senior presidential official made the remarks to reporters on Wednesday when asked about presidential adviser Moon Chung-in's comment that it will be hard to justify the presence of U.S. troops after the peace treaty is signed. The official said that Moon is a presidential special adviser, but has freedom of thought and speech as a scholar, adding the president gets help from the adviser's political opinion, but is not bound by it. 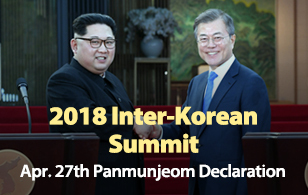 The official said that a peace treaty is a deal involving South and North Korea, the U.S. as well as China, aimed at establishing peace on the Korean Peninsula. He reaffirmed the Seoul government's position is that the presence of U.S. troops is necessary as they can act as a mediator on the peninsula, which is surrounded by powerful neighbors like China and Japan. Regarding locations for the U.S.-North Korea summit, the official said that Pyongyang was not mentioned as a possibility when President Moon spoke on the phone with U.S. President Donald Trump on Saturday.